Spartacus slot is definitely a champion when it come to the reels size. Any bigger, and they’d hinder the process. Right now they’re just big enough to add to the fun. The “transferring wilds” in the main game and “transferring nudging wilds” in the free spins are nice too. Go get yourself a giant stack of wilds. Spartacus slotus by WMS throws you into the Coliseum arenus to fight and entertain the crowdus. (Okay, we’re done.) Sadly, it’s not a licensed slots, so you won’t see any shotus from Spartacus: Blood and Sand, just generic gladiatorus dudes and dudesses, and as much as we’d love to, we just can’t go on with the whole Biggus Dickus thing. Sorry. The game looks fine - both the symbols and the background are of high quality, the sound effects are nice, and the animation is fluid. However, the first thing that catches the eye is not the graphics. It’s the second set of reels, aptly called Colossal. It’s a huge field of 5x12, with all the symbols running in stacks. Most of the game’s features rely on those Colossal reels. Specifically, the scatter symbol (Coliseum), that activates the free spins, and the wild (game logo). Just like all other symbols, the wild runs in stacks. When a full stack of wilds appears somewhere on the main reel set (meaning it takes the full reel), the corresponding reel in the Colossal set turns wild as well. Three or more scatter symbols trigger free spins, and the exact number of spins (up to 20) depends on the number of scatters. They don’t even have to appear on one reel set - three of them across both sets will do the trick. The free spins also have a special little feature attached to them, called Nudging Wilds. If a single wild appears somewhere on the main reel set, it “nudges” and the whole stack of wilds drops down. You remember what it means, right? The Colossal set will get its wild reel as well. Spartacus slot has a cool feature that guys from WMS use in several of their slots - the second set of Colossal reels. It spices up the gameplay, and more importantly, shares wild reels with the main set, thus increasing your winnings. The whole gladiator theme is nice too. 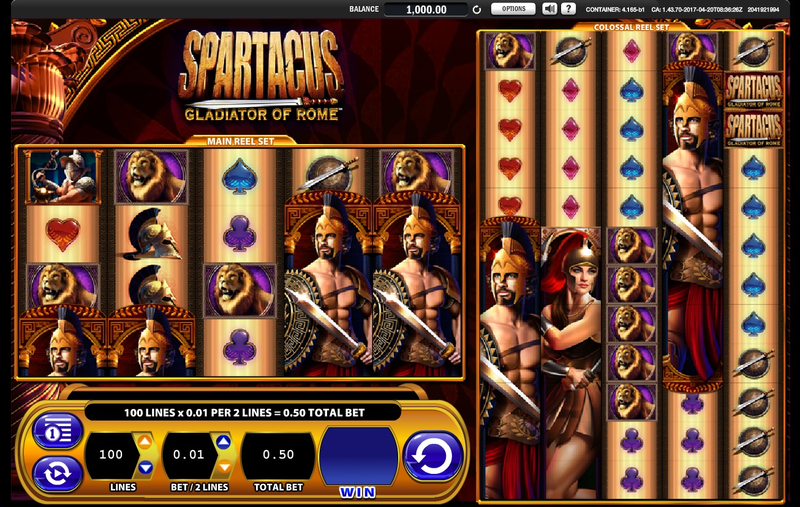 Click here to play Spartacus slot - because one reel set is just not enough anymore.